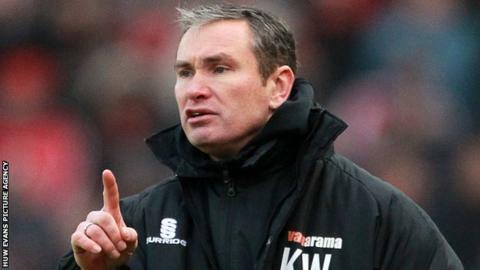 Wrexham will not underestimate opponents North Ferriby United in Sunday's FA Trophy final at Wembley says manager Kevin Wilkin. The Dragons were Trophy winners in 2013 and play in the Conference, a division above North Ferriby. "We take nothing for granted. We're fully aware what cup competitions do for teams," Wilkin said. "We ran Stoke mightily close in the FA Cup and they are three or four levels above us." Wilkin added: "It will make for an interesting encounter. "It's important that we maintain our focus on the job in hand and do the job." Sunday's final will be Wrexham's third appearance at Wembley with North Ferriby making their second appearance at the home of English football. The Conference North side reached their first FA Trophy final after defeating Bath on penalties in the semi-finals. Wilkin, who succeeded FA Trophy winning manager Andy Morrell in March 2014, respects what North Ferriby have achieved. "You don't get to the final of the FA Trophy if you're not a capable side," Wilkin added. "The cup run they've been on has had a little bit of a detrimental effect to their league form but they're still in and around the mix. "There's still a possibility they can make the play-offs. They've had a strong campaign." Wilkin has visited Wembley on several occasions and was in the crowd when Wrexham beat Grimsby Town on penalties in 2013. The former Nuneaton Town manager says he has fulfilled an ambition by reaching a Wembley final. "You dream of it but you don't ever think it will become reality," Wilkin said. "But it is now and I'm very much looking forward to the day and I hope everyone concerned with Wrexham is looking forward to the day."